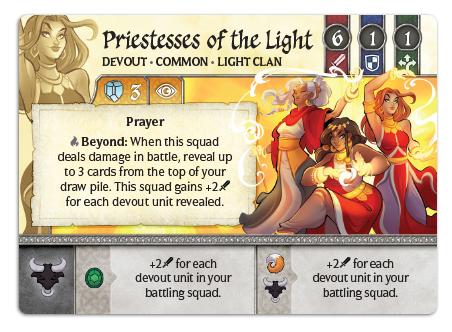 Check out the first preview of the Light Clan! How many times have you been in a situation where you could score a crystal if only you had one more initiative? Or where you just needed to draw a certain card? It can seem like luck never swings your way in those situations... except when you're playing as the Light Clan. 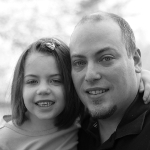 They don’t rely on luck - they use the power of Prayer. When you have a unit with Prayer in your hand, you may remove it from the game to gain exactly one of those benefits. I’m often very willing to remove a card or two for that extra initiative boost. However, taking this action does have two big drawbacks. The first is that you’re giving up a card from your hand, so you will need to replenish sooner rather than later. The other is that you’ve reduced the size of your deck, which could cause a reshuffle (and your opponent gaining a free crystal) to occur much more frequently. Servants of the Light aren’t so good at fighting. They’re a pretty weak unit on the battlefield and you may find more benefit in using them for their Prayer ability. However, Enter the Light allows you to get some use out of them first, since whenever they are destroyed you may elect to place them back on top of your draw pile. This allows you to save their Prayer for when you really need it. 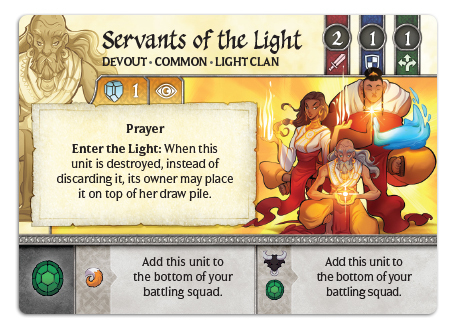 But there’s another reason that you’ll want to know that your Servants of the Light are on the top of your deck. Beyond allows you to reveal up to 3 units from the top of your deck and grants an extra attack. If you stack your deck just right, Priestesses can deal a whopping 12 attack. That’s enough to single-handedly destroy any unit in the game. However, those revealed cards do need to return to the deck in the same order, so think about what information you’re revealing to your opponent. Shimmerstone Clerics can use their Barrier to protect the rest of their squad from receiving damage. This gives you a second chance at destroying an enemy squad, or forces your opponent to battle you more than once before your squad is destroyed. 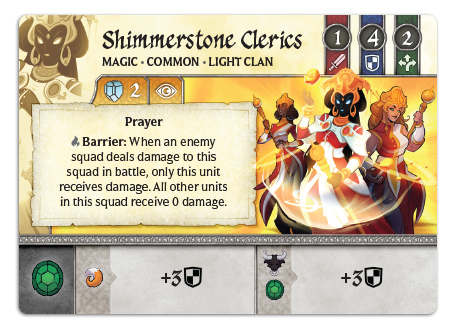 One other neat thing about Shimmerstone Clerics, as well as some other units in the Light Clan, is that both sides of their battle effect are balanced. No matter what card your opponent plays, you know exactly what benefit you’re going to gain. Undying units resurrecting from death is unholy in the eyes of the Light Clan, who believe there is a better way to grant the gift of life. 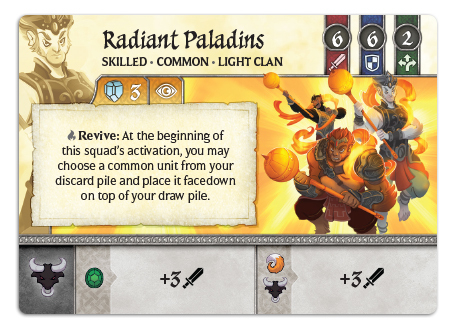 Revive allows you to return a common unit from your discard pile to your draw pile every time the Radiant Paladins are activated. This is especially helpful for devout players who have already made great use of Prayer, and are now playing with less cards available..
As you’ve seen today, Prayer is a great tool to get you out of some pretty sticky situations. But just where do these prayers go? We’ll find out next week! Remeber, both Light and Fire Clans are available now for preorder. 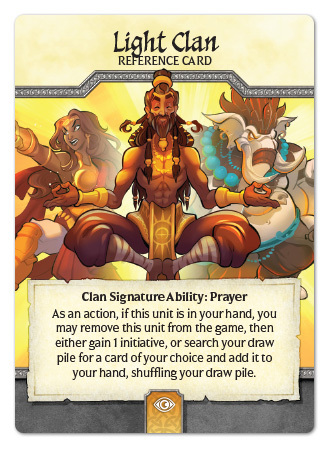 If you didn't see this week's Fire Clan preview, be sure to check it out!